Want to give your child a wonderful first experience at the dentist? 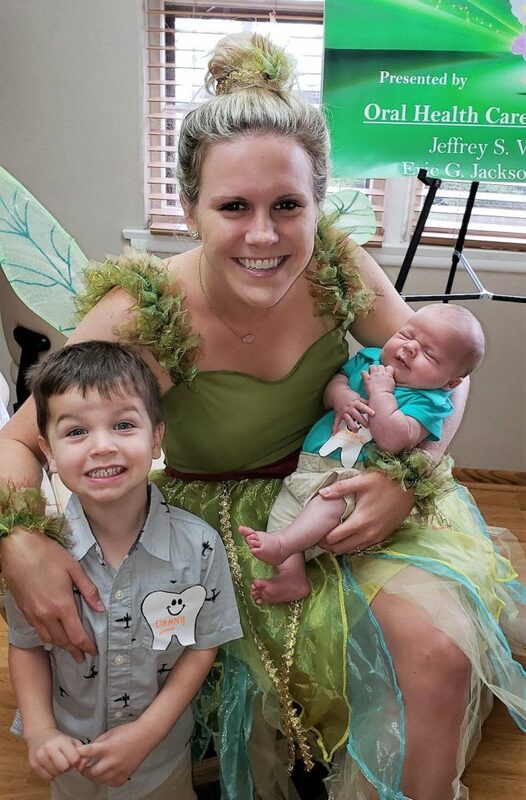 Take them to Dr. Eric Jackson at Oral Health Care Professionals for Tooth Fairy Day, a free event on Friday, May 3, 2019 from 9:00 – 12:30pm! You do not have to be an existing patient of their office for your children to attend their free Tooth Fairy Day! Call (630) 963-6750 to reserve your time to meet the Tooth Fairy and explore the dental office. Wondering when you should be taking your son or daughter to the dentist for the first time? We have some great advice on that subject from Dr. Jackson as well! Tooth Fairy Day is a fun opportunity for your child to ride in the dental chair, squirt water and air from the instruments and become familiar with being in the office without having an exam or cleaning. In addition to getting accustomed to a dental office, they also get to meet the Tooth Fairy! She will chat with your little one and spend some time getting acquainted. A picture is taken of your child & the Tooth Fairy as a complementary keepsake to bring home. They also receive a goody bag, fun hand stamps, and a helium filled balloon! I took my son to Tooth Fairy Day when he was about two and a half years old and we had a wonderful experience there! He had the opportunity to explore the office and interact with Dr. Jackson, who was so kind, friendly, and welcoming. I highly recommend this experience for your kids. What a great time for them to ask questions, be curious, and feel comfortable in a dentist office! What is a good age to take your child to the dentist for the first time? If you are asking that question, you are in great shape! The American Academy of Pediatric Dentistry (AAPD) advises that a child’s first dental appointment should occur “when the first tooth appears, or no later than his/her first birthday.” However, if going to the dentist is part of your family’s routine, then you most likely are instilling good dental hygiene, so you can schedule their first appointment at an age when a traditional dental cleaning can easily be completed. For most children, this is around the age of two or three years old. For more information about when to take your child in for their first dental visit and information about brushing baby teeth, visit Dr. Jackson’s article on Kidlist, titled Your Child’s First Dental Visit: When to Take Your Child to the Dentist. Tooth Fairy Day is a great way for your child to get used to a dental visit! Positive talk at home about the dentist and the Tooth Fairy is also extremely helpful. It is good to avoid phrases like, “You don’t need to be afraid,” or “They won’t hurt you.” These thoughts may never have entered your child’s mind. Letting your child know what to expect in a calm and reassuring way is the best preparation for that special first visit. Tooth Fairy Day is a free event and you do not have to be an existing patient to attend. Call the office at (630) 963-6750 to schedule your time slot with Dr. Jackson and the Tooth Fairy. Dr. Eric Jackson is extremely passionate about modern dentistry and loves discussing it with patients, so don’t hesitate to contact him by either scheduling a complimentary appointment, talking to him during Tooth Fairy Day, emailing him at ericjacksondds@gmail.com or tweeting @EJacksonDDS. You can also follow him on Instagram for helpful dental tips: @jacksonfamdentistry. Be the first to comment on "Free! Tooth Fairy Day 2019"